Sam and I have decided, against our better judgement, that we might just about have enough interesting stuff going on to warrant writing a blog now and again. It feels a little like homework that I’m not sure anyone will read! Anyway, as it’s a first for me, I’ll keep it short. 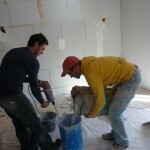 All is quiet at BV towers as I write this – Sam is plastering the new house with a helping hand from Ian, who’s down from Paris for a bit of mountain air. Beware, you might think you’re coming to Landry for a holiday, but you’ll soon end up with one of Sam’s old T-shirts on and a plaster trowel in your hand. There is the reward of a sneaky little bike ride to do St Germain this evening though, it’s not all hard work and no play!